Thòisich obair gus leasachadh a dhèanamh air Cala Steòrnabhaigh dimàirt. 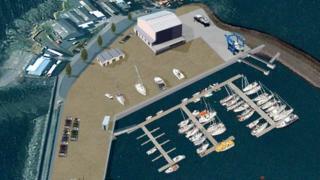 Cosgaidh am pròiseact, a bheir dhaibh marina ùr agus cala domhainn, còrr agus £60m. Bidh cosgais de £11m anns a chiad earrann dhen phròiseact. Thèid Bàgh Newton a dhèanamh nas doimhne le 70 àite a bharrachd do iataichean. Bidh goireasan ùra air Eilean nan Cobhail do sheòladairean agus an cuideachd. Tha planaichean ann airson lamraig ùr agus bùth-obrach airson bàtaichean a chàradh. Tha Iomairt na Gàidhealtachd 's nan Eilean a' dol a chur ris a' phròiseact le bhith a' sgeadachadh seann thogalaichean ann an Newton agus Ìnacleit. Tha an obair uile mar phàirt de phlana mhòr Ùghdarras a' Chala a bheir 20 bliadhna a thoirt gu buil. Am measg sin, tha plana airson cala nas doimhne aig Àranais agus cidhe fada far an urrainn do shoithichean mòra luchd-turais ceangal agus rathad ùr eadar sin agus am baile.